A competitor of the company trying to build a Dallas-to-Houston bullet-train connection has blasted the notion that a high-speed rail line can be built without public money. Those remarks came after Texas Central Partners announced last week it had secured a loan of up to $300 million from Japan Overseas Infrastructure Investment Corp. for Transport & Urban Development and the Japan Bank for International Cooperation. Both institutions are backed by the Japanese government. SNCF America leaders also called on the Texas Legislature to give direction to the high-speed rail policy debate. The company last spring lobbied state legislators to consider its plan to serve the Interstate 35 corridor with “higher-speed” rail, rather than bullet-train technology. See here for some background on SNCF and their counter-proposal for high speed rail in Texas. I don’t have the technical knowledge to evaluate their claims about the merits of their system versus TCR’s, and whether one thinks “Japan Overseas Infrastructure Investment Corp. for Transport & Urban Development and the Japan Bank for International Cooperation” count as “public money” when none of it came from US taxpayers is a matter if taste and semantics. What I do know is what I’ve said before, which is that I wish both SNCF and TCR would build their proposed rail lines so that we can get as much of it as possible. The Dallas Business Journal has more. Amtrak and Texas Central announced a partnership Friday to link the proposed bullet train from Dallas to Houston to the national passenger rail network. Passengers will be able to book their bullet train trips through Amtrak. The partnership also commits the high-speed rail operator to transport passengers between Amtrak’s Dallas endpoint, Union Station, to the Texas Central’s multilevel station between South Riverfront Boulevard and South Austin Street. Texas Central will also provide similar shuttle service between the Amtrak endpoint and the former mall site it has chosen for a terminal in northwest Houston. The agreement also makes Amtrak training, marketing and sales capabilities available to Texas Central. See here for the press release. I don’t know how many people might take advantage of this networking between Amtrak and Texas Central, but being able to plug into Amtrak’s ticketing system instead of having to build their own is a win for TCR. And seriously, all of the connections, from the proposed extension to D/FW Airport to the Uptown BRT and whatever else Metro may build to this, they’re all good and make the overall system better. Keep it coming. The DEIS hearings go as you’d expect them to. Meetings to discuss a proposed high-speed train between Houston and Dallas pulled into some of the areas most opposed to the project on Tuesday night, as federal environmental meetings continue to make their way to Houston. Residents in Jewett – perhaps the epicenter of animosity over the 240-mile line – showed up in droves to Leon County High School. At points, with a high school basketball game next door, parking was scarce as residents and elected officials from at least five counties came to the session. Concerned about their rural character and their property rights, many landowners said they simply didn’t want train tracks crossing the county. Leon County commissioners have passed three resolutions and numerous other items intended as roadblocks to the rail line. Many speakers Tuesday emotionally noted how the train risks their rural charm, some of whom live on land that has been in their families for five, six and seven generations. Opponents spoke of hunting and outdoor activities that the train would disrupt, along with aesthetics and possible noise and safety fears. At least two attendees suggested feral hogs in the area would run wild because of worries of shooting near the tracks. Tales ranged from worries about a landowner’s autistic son who reacts poorly to loud noises, decades of family campouts, emergency response times for elderly ranchers and property sovereignty. Of 36 people who asked to speak publicly at the session, all voiced opposition to the project. About two dozen others asked about their feelings said they were against it. No one, when asked by a reporter, said they supported the train. See here for some background. On the one hand, I sympathize with these folks. The train line will go through all these rural counties, but there’s only one station for them. I’ve no doubt I’d be unhappy in their position. On the other hand, public infrastructure projects have taken land from people since forever. It’s a price of progress, and it’s always been this way. The people affected get a chance to affect where the project is built, they get a reasonable price for the land that they lose, and let’s be honest, in this case they’d be getting a lot less attention and consideration if the project in question were another highway. I sympathize, but I think this rail line will be good for Texas, and I want to see it happen. I want the people affected to be treated fairly, but not to the point where they get a veto. You got something you want to say about the proposed high speed rail line and its possible routes, here’s your chance. Houston residents are being asked to weigh in on a plan to build a $12 billion high-speed train between the city and Dallas. The meeting is set for Feb. 5 and will be coordinated by the Federal Railroad Administration, which must approve plans for the Texas Bullet Train. Texas Central, which has support from Houston and Dallas city officials, said the line would stop south of downtown Dallas and then in Houston, near Loop 610 and U.S. 290, the Houston Chronicle’s Dug Begley reported. Madison County – Monday, February 5, 2018, 5 p.m. to 9 p.m.
Harris County – Monday, February 5, 2018, 6:00 p.m. to 10:00 p.m.
Grimes County – Tuesday, February 6, 2018, 6:00 p.m. to 10:00 p.m.
Waller County – Tuesday, February 6, 2018, 5 p.m. to 9 p.m.
You can also provide feedback or sign up to receive updates on the project from the Federal Railroad Administration here. As a reminder, there are three possible locations for the Houston terminal, and one of the goals of the DEIS project is to pick a winner from those three. So speak now or forever hold your peace. ONE OF THESE 3 spots revealed in a report from the Federal Railroad Administration will be the planned site for the Houston-Dallas high-speed rail line’s Houston terminal. All 3 are near the intersection of the 610 Loop and the BNSF rail tracks that run parallel to Hempstead Rd. just south of 290. In the map at top, the station takes the land directly north of the Northwest Transit Center, where an industrial complex home to Icon Electric, Engineering Consulting Services, and others exists now. Hempstead Rd. is shown fronting Northwest Mall at the top of the plan. Another proposal puts the station in the spot where the mall is now. See here for the background, and click over to see the locations. We’ve known for some time that the station would be near the 610/290 junction, so now it’s just a matter of picking the precise spot. All three should be proximate to the Uptown line when it finally gets built, and of course there have been discussions with the Gulf Coast Rail District about connecting the line to downtown. So even after the final decision is made, there will still be a lot more to do. I’ve been pondering whether our state is big enough for two high speed land-based forms of transportation, and I think the answer is “yes, at least for now”. The Hyperloop is nearly twice as fast as Texas Central’s High-Speed Rail project already in the works to connect Houston and Dallas. To boot, the lightning-quick travel time is not even direct. The journey is routed through Austin, which would act as a hub connecting the Texas cities. Hyperloop One could also be operational before Texas Central’s line. In its announcement, Hyperloop One declared its intent to begin shipping freight by 2020 and passengers by 2021. One major factor will be ticket pricing. Texas Central has not released specifics but expects pricing to be on par with airline prices. That will likely be far cheaper than the Hyperloop, which is expected to be around $330 one-way. If Hyperloop One does move forward in Texas, it will likely face many of Texas Central’s same growing pains; the company has met plenty of resistance from Texas landowners. Unlike Texas Central, which is developing its project privately, Hyperloop One will work with government agencies on development in some capacity. Though the specific arrangement has not yet been detailed, Hyperloop One is already working closely with the Colorado Department of Transportation and has said it intends to continue government relationships wherever it ends up. A spokesperson for Texas Central told Bisnow the two projects are not in competition. Hyperloop One is not building a direct line from Houston to Dallas. Texas Central sees the two different modes of transportation as complementary, similar to airlines. See here for some background. I’m glad to hear that both Hyperloop One and Texas Central see their systems as complimentary and not competitive at this time. Things may change if they’re both successful, of course, but we’re at least a few years out from that. Unlike high speed rail, hyperloops are brand new and untested technology, so who knows what will happen with the development, but like high speed rail there is likely to be opposition from communities that this project will pass through. I have to think we’ll begin to hear more about this now that the chances of it happening here are greater. In the meantime, one of the lead planners with AECOMM on this project has been talking to the press about it – see this followup story in Bisnow and this DMN article for his thoughts. I remain excited by the possibilities, but still want to see this thing in action before I buy in all the way. We’re still a long way from anything happening, but if it does it could happen here. There’s still a chance Texans could be some of the first people in the world to whisk along in tubes at 700 mph. 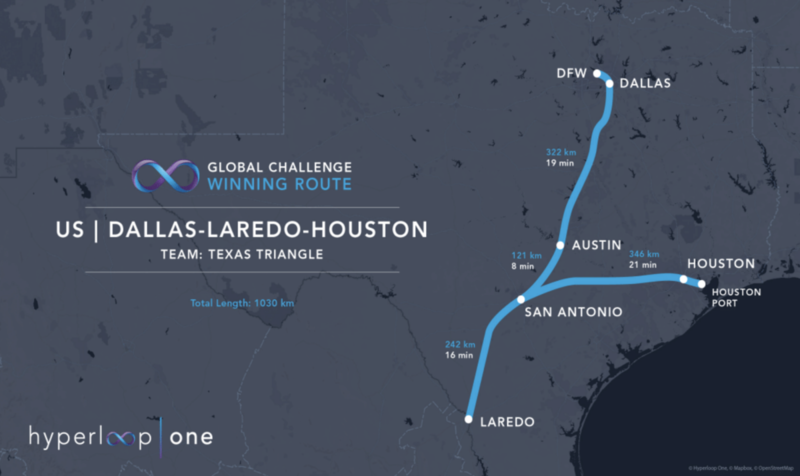 Hyperloop Texas, a joint proposal of engineering firm AECOM and public agencies in the state, is one of 10 winners of the Hyperloop One Global Challenge, a competition to find the best routes for the system. Hyperloop, the brainchild of Tesla founder Elon Musk, envisions vacuum tubes and travel pods making interstate travel at faster-than-flight speeds. In their proposal, AECOM estimated the trip from Houston to San Antonio could be made in 21 minutes. Getting to Austin would take another eight minutes. Houston-to-Dallas, not including the time for layovers, would take 48 minutes. A freight component would use the Hyperloop system to ferry goods from Laredo to the Port of Houston. See here for the background. What I like about the proposed route is that it wouldn’t directly compete with the Houston to Dallas high speed rail line. 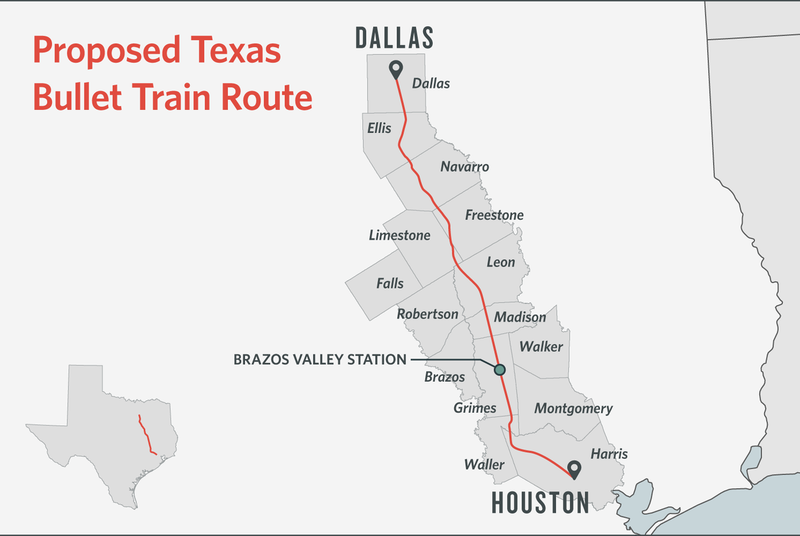 You can get to Dallas from Houston via this route – indeed, you can get all the way to DFW Airport – but you have to go via San Antonio, so the total travel time is shown as 48 minutes, about what it would be for the Texas Central ride. Basically, this is the Texas T-Bone, with Laredo, DFW, and the Port of Houston as the endpoints. We can debate whether this technology is feasible or not, but if it is, then I hope subsequent routes include some of the spaces in between and elsewhere. Let’s add stations in New Braunfels and San Marcos and Waco, and do a similar T-Bone in the other direction, to bring in El Paso and Midland/Odessa and Lubbock and Amarillo. If it works, of course. I can dream, can’t I? KUT has more. At City Hall, Houston and Texas Central Partners announced the signing of a memorandum of understanding, which commits both sides to share environmental surveys, utility analysis and engineering related to the project and surrounding area and work together to develop new transit and other travel options to and from the likely terminus of the bullet train line. In the memorandum, Texas Central notes the likely end of their Houston-to-Dallas line will be south of U.S. 290, west of Loop 610 and north of Interstate 10. The exact site has been long suspected as the current location of Northwest Mall. The cooperation between Houston and Texas Central is no surprise. City officials, notably Mayor Sylvester Turner, have praised the project, with the mayor citing it among examples of his goal of reducing automobile dependency. “We also look forward to the project’s creation of job opportunities and economic development,” Turner said in a prepared statement. 3. Hempstead Corridor. Texas Central agrees to coordinate with the City, Harris County, METRO, TxDOT, and GCRD to plan and create the design of the Hempstead Corridor. Texas Central agrees that the design of the Hempstead Corridor must preserve feasibility for high capacity commuter transit. Upon the submission of final approved design plans, and the final approved Definitive Agreements, the Mayor may present to City Council for consideration and approval a resolution or ordinance allowing Texas Central use of the Hempstead Corridor for the purposes contemplated by the Project. and from local transit systems. 5. Houston Terminal Station Location. Texas Central has advised the City and the City acknowledges that Texas Central proposes to locate the Houston Terminal Station in the general area south of U.S. 290, west of Loop 610, and north of I-10. Texas Central will consult with the City prior to finalizing the location of the Houston Terminal Station. 6. Connections to Major Activity Centers. In order to minimize mobility impacts on existing mobility systems and enhance local transportation options, Texas Central will coordinate with the City, METRO, TxDOT, the GCRD, and other agencies as needed for the study, design and construction of connections specifically related to the Project to facilitate efficient multi-modal connections between the Houston Terminal Station and the City’s major activity centers. If Texas Central or the City engages a third party to provide services related to such study, design and construction of connections, the allocation of costs and expenses related to such study, design and construction of connections contemplated by this paragraph 6 shall be mutually agreed upon by Texas Central and the City prior to engaging the services for same. First, this confirms what everyone basically knew, that the terminal will be at 290 and 610. Of interest is the terminal as an intermodal center, designed to connect people to other forms of transit, as well as the discussion of what those other connections will be. The Uptown BRT line will be one such connector, and then there’s the possible “Inner Katy” light rail line, which as we know from previous entries would involve all of the groups name-checked in point #6. Whether that is dependent on the next Metro referendum, which would likely be in 2018, remains to be seen, but I hope it means we start seeing some activity on possible design and routes for such a line. I’m excited by this. Swamplot and the Press have more. Backers of a Texas bullet train are moving to the next stop, selecting a team to build the Houston-to-Dallas line, despite not having a clear shot – yet – at construction. 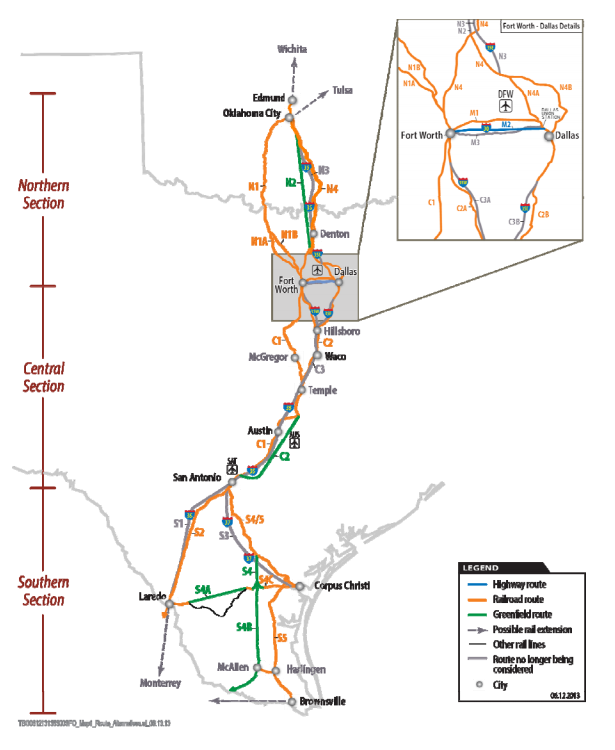 Texas Central on Monday morning announced it reached agreement with Irving-based Fluor Enterprises and The Lane Construction Corporation, based in Connecticut, for further refinement and study of the proposed route. Once financing for the project, expected to cost at least $12 billion, is secured and federal approvals are obtained, the companies would then be the primary design-builders of the line. Texas Central, which despite some opposition emerged from the state legislative session unscathed, is also awaiting a federal environmental process necessary to proceed. Company officials are also lining up financing for the project. Any construction will have to wait for those outcomes. In 2014, officials predicted work would start by 2017. Based on typical timelines for federal review, the earliest construction could start on the line would be late 2018, meaning a 2023 completion, according to Texas Central’s previous timelines. The company also continues to face opposition, especially in rural areas of Texas where some landowners remain steadfast in not selling their land, and local elected officials have said the project provides little benefit. I post this not because it’s particularly interesting but to put a pin in where we stand today. Texas Central survived the legislative session without anything bad happening to them, and if all goes more or less as they say, they will have started construction on the line by the time the 2019 Lege gavels in. Will that be sufficient insurance against further legislative meddling? Maybe, I don’t know. On the one hand, a project in progress ought to be harder to kill, but on the other hand since this project will necessarily involve some taking of land, that may just amp up the urgency. Ask me again in January of 2019. Assuming the legislative field is clear for now, the remaining hurdles are as noted the draft environmental impact statement, and the ongoing legal skirmishes regarding whether or not Texas Central qualifies as a “railroad” and thus can exercise eminent domain. I don’t expect anything weird from the DEIS though one never knows. What I really don’t know is what happens if individual landowners can keep TCR away from their property. If they don’t have any legal leverage, I’m not sure how this thing gets built. I’m sure TCR has its best people working on that, so we’ll just have to see how it plays out. Where do we stand with the anti-Texas Central bills? They’re in the House, and we’ll see what happens from there. The four bills before the House Transportation Committee represented some of opponents’ latest efforts to stop the project in its track. But project supporters and Texas Central Partners executives told the committee that some of the bills were unusually anti-free market for Republican-backed legislation in Texas. “’A better business environment than Texas’ is not a phrase that I’m used to saying, but that’s what this bill contemplates and it’s not how we do things here,” Texas Rail Advocates executive director Chris Lippincott said about House Bill 2104. That legislation would require any private companies building high-speed rail lines to file a bond that would cover the cost of reverting all land bought for the project back to its previous use if train service ever stops. Texas Central leaders said such a requirement would be so costly that it would deter potential investors from putting money into the rail line. “The project would never get built,” Texas Central president Tim Keith said. The bills debated this week were left pending in the House transportation committee. They are among more than 20 pieces of legislation filed by 10 lawmakers in both chambers aimed at the project. But with just a few weeks left in the session, no bill that could fatally disrupt ongoing development of the rail line has passed either chamber. And legislators have so far had little traction with bills or maneuvers that would prohibit the company from using eminent domain to acquire land needed for the project. Another bill before the House committee, House Bill 2163, would require that the bullet train tracks running through Dallas, Ellis, Waller and Harris counties be built on columns that are 40 feet high. Much of the rural opposition is rooted in fears that the train tracks will divide existing properties and form a barrier restricting the movements of people, livestock and other animals. They also say it will restrict development spilling over from the state’s major metro areas. “The best way to protect growth and development in that area is for this train to be elevated on pylons on a viaduct,” said the bill’s author, state Rep. John Wray, R-Waxahachie. Company officials said they can’t yet commit to building the track at 40 feet for such long distances because the project is still going through environmental review. But Keith said 60 percent of the tracks will be on viaducts. And he told Wray that expected population growth is a factor when the company considers where to raise the tracks on viaducts instead of earthen berms. One tweak to state law pushed by opponents of the project is not currently drawing Texas Central’s opposition. House Bill 2172 would prevent legislators from spending state funds to plan, build, maintain or operate a privately owned high-speed rail line. That is the companion legislation to Senate Bill 977, which the upper chamber passed last month. Both bills have wording similar to a provision in the Senate’s proposed budget. See here for the background on the Senate bills that had been passed out of committee. In addition to SB977, two more bills were subsequently passed by the full Senate, SB979 and SB975. The House bills mentioned in this story, all of which were left pending in committee on Thursday, would need to be passed out of committee today as that’s the deadline for any bill to receive final consideration. I’ll keep an eye on that and check back later. All things considered, so far things don’t look too bad for Texas Central, but as we know with the Lege, it ain’t over till sine die. The Texas Tribune and the Dallas Morning News are teaming up on a deep dive into the Texas Central Railway’s high-speed rail proposal. This story, the third in their set, explains where the money to build this thing may come from. But, really, how does a private company go about lining up the billions of dollars it needs to pay for a 240-mile bullet train line? And is it possible for it to actually turn a profit? First, it’s important to distinguish between financing and funding a major infrastructure project, said Michael Bennon, managing director of Stanford University’s Global Projects Center. Financing is how Texas Central will get enough money to build the high-speed rail line in the first place. Funding is the revenue that will keep the train running. “They’re two very different things and people get them really mixed up,” Bennon said. Financing is the more complicated side of the equation because it’s essentially a high-stakes gamble that may not pay off for decades. Texas Central executives are confident they’ll be able to find the money, in large part because investors are hungry for “real assets” — tangible projects, basically — that could provide bigger returns than what’s available in today’s market. Managers of huge pots of money, like private equity funds or pension funds, “have obligations to pay their plan holders and they need long-dated assets,” Keith said. In other words, low interest rates and other factors have meant that there aren’t a lot of places to park portions of those pools that will reliably pay out to investors over long periods of time. That’s part of why pension funds, which are supposed to be how workers get paid their retirement, are seeking out safer investments. Upfront money from investors will pay for roughly a third of the project, Keith said. The other two-thirds will be debt. So far, Texas Central has raised about $115 million from investors. Keith said Texas Central is considering a range of financing options, including federal credit programs that would essentially provide cheap loans aimed at spurring infrastructure construction. More private capital is finding its way into projects that were once the domain of government. The McKinsey Global Institute recently noted that institutional investors — like the pension and private equity funds Keith mentioned — “seem like an obvious source of capital” in a world where increasingly urgent infrastructure projects are seriously underfunded. Its report said institutional investors have $120 trillion to move around. Blackstone Group, the world’s biggest private equity firm, is reported to be raising as much as $40 billion for infrastructure investments. Of course, there are caveats. “To attract these investors, governments and other stakeholders need to develop their project pipelines, remove regulatory and structural barriers, and build stronger markets for infrastructure assets,” the McKinsey report said. Public-private partnerships, like toll roads, have had mixed success, including in Texas. Still, the McKinsey report underscores the hunger for worthy projects. “Insurance companies and banks recount instances in which investors outbid each other in a rush to finance the rare infrastructure deals they consider ‘bankable’ and that have appropriate risk-return profiles,” the report said. All that goes to say there are institutions that could theoretically bankroll a high-speed rail line. But only if it’s a sustainable business. And that points back to the second part of paying for a big infrastructure project: funding. Infrastructure projects rely on two main sources of funding — taxes or user fees, Bennon said. For public transit, it’s usually a combination of both. Texas Central has promised not to use tax money as funding. That leaves ticket sales, plus smaller sources of side revenue from station parking fees and concessions. Texas Central has said the project passes muster, by that measure. “This project is fully financeable based on ticket sales,” Keith said. That’s what experts — and critics — are skeptical about. [Tuesday], a group of key state lawmakers filed a slate of legislation to push back against Texas Central Railway’s controversial proposal to construct a high-speed rail line between Dallas and Houston. Senators Birdwell (R-Granbury), Creighton (R-Conroe), Kolkhorst (R-Brenham), Perry (R-Lubbock), and Schwertner (R-Georgetown) joined with Representatives Ashby (R-Lufkin), Bell (R-Magnolia), Cook (R-Corsicana), Schubert (R-Caldwell), and Wray (R-Waxahachie) to file a total of 18 bills addressing a number of concerns ranging from protecting landowners threatened by eminent domain abuse to ensuring the state isn’t later forced to bail out the private project with taxpayer dollars. SB 973 by Creighton/HB 2168 by Bell (Railroad Determination Before Surveys) – prohibits a private high-speed rail entity from entering private property to conduct a survey unless the Texas Department of Transportation (TxDOT) first determines that the surveying entity is, in fact, a railroad. SB 974 by Creighton/HB 2181 by Cook (Option Contract Protection) – voids any high-speed rail option contracts held by a high-speed rail entity upon a bankruptcy initiated by or against the entity. SB 975 by Birdwell/HB 2169 by Schubert (Security Requirements) – provides a framework of minimum security requirements to be followed during the construction and operation of a private high-speed rail line. Requires the high-speed rail authority to coordinate security efforts with state and local law enforcement, as well as disaster response agencies. SB 977 by Schwertner/HB 2172 by Ashby (No Taxpayer Bailout) – prohibits the legislature from appropriating new funds, or allowing state agencies to utilize existing funds, to pay any costs related to the construction, maintenance, or operation of a private high-speed rail in Texas. SB 978 by Schwertner/HB 2104 Bell (Property Restoration Bond) – requires a private high-speed rail entity to file a bond with the Texas Department of Transportation (TxDOT) sufficient to restore property used for the rail service to the property’s original conditions if the service ceases operation. SB 979 by Schwertner/HB 2179 by Cook (Right of Repurchase for Non-HSR Use) – prohibits an entity that operates or plans to operate a high-speed rail from using property acquired for purposes other than high-speed rail. If the high-speed rail authority doesn’t use the property for that specific purpose, the original landowner must be given the opportunity to repurchase the land. SB 980 by Schwertner/HB 2167 by Schubert (Put Texas First) – prohibits any state money from being used for any purpose related to a privately owned high-speed rail, unless the state acquires and maintains a lien in order to secure the repayment of state funds. Requires that the state’s lien be superior to all other liens, effectively making Texas a priority creditor. SB 981 by Kolkhorst/HB 2162 by Wray (Interoperability) – requires an entity constructing a high-speed rail line in Texas to demonstrate compatibility with more than one type of train technology. SB 982 by Perry/HB 2173 by Ashby (High-Speed Rail Feasibility Study) – upon request of a legislator, the Texas Department of Transportation (TxDOT) must generate a feasibility study of a proposed high-speed rail project. The study must indicate whether the project is for a public use, whether it will be financially viable, and what impact of the project will have on local communities. The full press release is here, and a Chron story about it is here. I was expecting some bills to be filed for the purpose of throwing sand in TCR’s gears, but this was more than I expected. Still, the basic dynamics of this fight have not changed as far as I can tell. The legislators leading it are primarily rural – even the ones who are based in suburban areas represent a lot of rural turf as well – and there are only so many of them. I’ve yet to see any legislator from a big urban area sign on to this. Which is not to say that at least some of them won’t go along with their rural colleagues, especially the urban Republicans, but that’s the ground on which this battle will be fought and won. If these legislators can convince enough of their urban colleagues to join them, then TCR is in a world of hurt. If not – if TCR can hold on to the urbanites – then it can survive the session and maybe get to a point where actual construction begins. Getting one or more of Greg Abbott, Dan Patrick, Joe Straus, and Ken Paxton to pick a side would help that faction greatly as well. Keep an eye on these bills as the committee hearings get off the ground. The DMN has more. The private developer of a planned bullet train between Dallas and Houston has withdrawn more than a dozen lawsuits against Texas landowners that sought court orders allowing the company access to private property to survey land for the 240-mile project. Texas Central Partners officials said they are instead going to try and have an “open dialogue” with landowners about letting the company onto their land. “We’re stepping back and going back to conversations and taking some of the heat out of our process,” said Texas Central President Tim Keith. 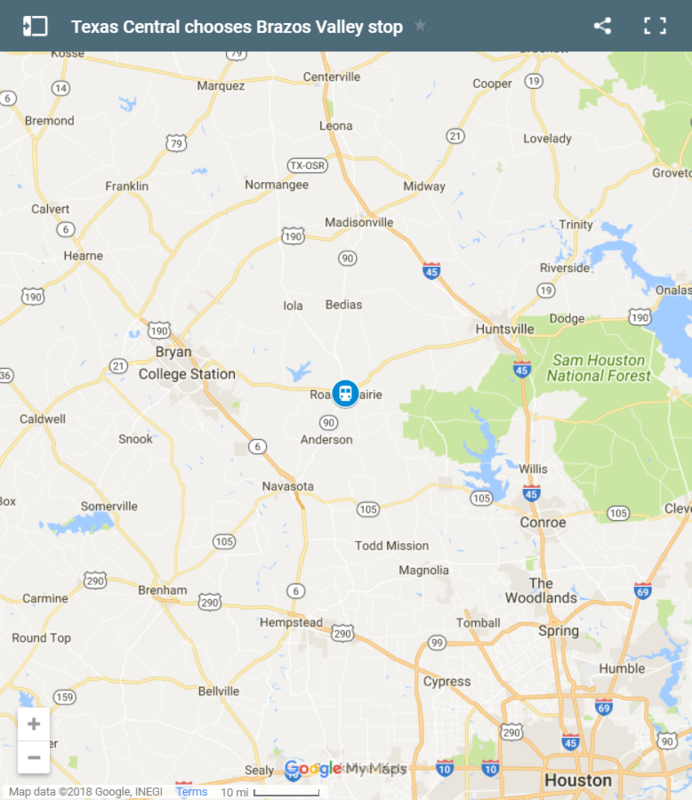 Texas Central Partners is developing a 240-mile bullet train line intended to transport passengers between Houston and Dallas in 90 minutes with a stop near Bryan. The company has partnered with Japanese train operator JR Central to bring its bullet train technology to Texas. The project has drawn support from officials in Houston and Dallas but opposition from communities and landowners that are expected to be near the train’s route. In court filings, the company argued that state law allows it to enter private property to survey land that may be used for a potential route because it is a railroad. A group called Texans Against High-Speed Rail have said the company shouldn’t be considered a railroad because it doesn’t currently operate any rail lines. In one Harris County lawsuit, attorneys for a landowner echoed that argument. A trial on the merits of those legal arguments was set for July, according to the Harris County District Clerk’s office. Keith said Tuesday that the company was confident it would have secured a ruling in its favor. Texas Central and landowners had already settled 21 other similar legal filings. The company said the decision to withdraw the remaining suits was largely based on the fact that it’s already reached access and land-purchase options with more than 3,000 landowners. See here and here for some background. Seems a little weird to me, but I’ll take them at their word for now. The Chron adds some details. The company planning high-speed rail service between Houston and Dallas announced Tuesday it has reached preliminary agreements to buy property from nearly one-third of the landowners along the planned route, including half of those in two counties where vocal opposition has been strongest. Texas Central said they have reached option agreements with owners of about 30 percent of the necessary parcels in 10 counties. The option agreements bind property owners to selling the right of way for the train, with the company paying them now for the right to purchase the land once Texas Central has final federal approvals and the funding to build the line, estimated to cost $12 billion. Texas Central said 50 percent of the parcels needed in Waller and Grimes counties are covered by the option agreements. Landowners in the two counties have been some of the most vocally opposed to the line, which they say will ruin the rural character of the area. Many also have accused the company of heavy handed tactics negotiating with land owners. Grimes County Judge Ben Leman, chairman of Texans Against High-Speed Rail, said the concerns with how property owners were approached should make people doubt the support Texas Central claims. “If you are a landowner and you are sitting in your house and someone comes to your door and says they have eminent domain, or you can sign this agreement and we’ll pay 5 percent down… are you going to use eminent domain and cross your fingers,” Leman said. [Leman] predicted the legislative session will be the “next big battleground” as the company seeks to have state lawmakers affirm some of its rights to use eminent domain, including a remedy to counties that have voted not to issue any construction permits to any entity that doesn’t have eminent domain authority, if the entity is crossing a public street. We definitely agree on the Lege being the next battleground. I’ve got my eyes open for relevant bills. Swamplot has more. A privately-funded bullet train between Dallas and Houston and a passenger rail line connecting suburban North Texas are among a litany of transportation projects considered priorities by President Donald Trump’s administration, according to The Kansas City Star. But what that means for the projects either financially or in a regulatory sense wasn’t immediately clear Tuesday. The Star reported that the document doesn’t detail how the listed projects “would be funded, how the federal government prioritized these projects or any timeline for completion.” It is not known if the document is finalized or a draft, according to The Star. Trump earlier in the day signed an executive order that aims to expedite the environmental review process of infrastructure projects, something that can often take years and cost millions of dollars. In a statement, Texas Central said it was “pleased” to be considered a priority. To the extent that one believes Trump actually intends to push for an infrastructure bill (*), this is the sort of thing that would be appealing to him, and independent of that scaling back on environmental regulations may well help speed this along. That said, one should remember that Texas Central has some high profile opponents among Texas’ Republican caucus, and I doubt that they will be swayed by any of this. That said, TCR can use and will be happy to have all the help it can get. We’ll see what comes of it. The Press has more. (*) – For what it’s worth, Democrats have their own infrastructure proposal, which differs in a few key respects from the as-yet-unspecific Trump plan. I don’t know how or if Texas Central would fit into that, and there’s a zero percent chance that it gets taken up for a vote in Congress, but it’s there if you want an eventual point of comparison. More support for Texas Central. David Arbuckle, who represents Texas Central, the private company developing the rail line, spoke to the council Monday night saying that although the rail line wouldn’t extend into Collin County, it is still important for residents there. “Plano residents could get on DART, go into downtown Dallas and be in Houston in about two hours,” Arbuckle said. Stoler said Plano is one of several cities passing resolutions in support of the project. The North Texas’ Regional Transportation Council also agreed earlier this year to support the project. This is not a surprise. Texas Central has received strong support from the urban metro areas at each end of its proposed line. The opposition is primarily from people in between. The open question is what the legislators along I-35 and points west will do when the inevitable bill stripping TCR of any authority to use eminent domain comes up for a vote. A comprehensive ridership study conducted by L.E.K Consulting has confirmed that Texas is ready for a privately developed Bullet Train line serving North Texas, the greater Brazos Valley and The Greater Houston Metro areas. According to this landmark study, 90% of the 16 million people living in the Texas Bullet Train service areas would save at least 1 hour on their journey times as compared to air or road travel. In addition, the overwhelming majority of surveyed Texan Travelers (over 83%) said they would use the Bullet Train in the right circumstances, with only 15% of survey respondents stating they would not consider any alternative but their personal vehicle. Looking further into the study, 71% of frequent travelers, and 49% of non-travelers said they either probably or definitely would use the Texas Bullet Train on their next trip to North Texas or Houston if it were an option today! Bringing together end-to-end journey time analysis, primary market research on perceptions of high-speed trains, and long distance travel market size estimates, it is possible to develop estimates for future levels of demand for the Texas Bullet Train. Ultimately, the L.E.K study concludes that Bullet Train ridership is anticipated to ramp up to 5 million journeys by the mid 2020’s, and 10 million journeys by 2050. That’s 30% of the anticipated number of long-distance trips between North Texas and The Greater Houston Metro Area. Here’s the study brochure. The main selling point is that travel times via Texas Central will be predictable and generally an hour or so less than either driving or flying, which includes the time it takes to get to the airport, get through security, get on the plane, and get your luggage afterwards. A large percentage of people they surveyed said they would the service, but then we kind of already knew that. I mean, they wouldn’t be investing all this money to build it if they didn’t have good reason to think that enough people would want to use it to make it profitable. Here’s the Chron story about this. The main question remains whether Texas Central will ever get to build the thing in the first place. Earlier this week, Waller County’s sub-regional planning commission – which has already stated its opposition to the train line’s passage through its area – filed a lawsuit in Austin against the Texas Department of Transportation, related to the transportation agency’s refusal to coordinate planning activities related to the line. TxDOT, under the guidance of the Federal Railroad Administration – which ultimately will approve or deny plans for the line – is the state agency overseeing Texas Central’s environmental plans. Waller County is claiming its objection and concerns to the line are being ignored, as federal and state officials prepare the environmental review. “Without meaningful coordination, our community will suffer immediate and irreparable harm and that is totally unacceptable,” Waller County Judge Trey Duhon said in a statement. The main obstacles at this point remain acquiring the land for the right of way, and whether or not Texas Central can use eminent domain. If they can make it through the next legislative session alive, I like their chances, but that remains a big if. Click2Houston has more. Something vague, and a bit confusing. It was one of several notable topics that came up during a wide-ranging Q-and-A with the Greater Waco Chamber of Commerce, where Abbott also vouched for the continuation of the Texas Enterprise Fund and provided a brief preview of the next legislative session. Abbott had previously expressed hesitation about high-speed rail, a perennial flashpoint in Texas that sparks debate over how to pay for it and its impact on property rights. He was again somewhat skeptical-sounding Thursday at the luncheon for the Chamber of Commerce, which supports high-speed rail. Waco is along a potential route being studied for a high-speed rail alternative to Interstate 35 that would go from Oklahoma City to Laredo. “You have to look at certain issues so that it works for all the different pieces of all the different constituencies, but most importantly look at at the bottom for the taxpayers in Texas, which is the thing that we have to be the greatest guardian of,” Abbott said. At first reading, I thought Abbott was speaking of high-speed rail in general, including the Texas Central Railway. That didn’t make much sense, since they’re a private company, and what does he care if they wind up making money or not? He still might have had them in mind when he said this, but at this point I think he was just referring to the Oklahoma/Texas line, which is a TxDOT project. Too bad, because it would be nice to hear what he thinks about Texas Central, given the target it has on its back in the 2017 Legislature. Will he support or undermine the efforts to kill it? Your guess is as good as mine at this point. As for this project, I think talk about the California HSR experience is premature. I suspect the escalating cost estimates for the California line – which is still in the conceptual stage – have as much to do with the price of real estate as anything else. I’m pretty sure that would be less of an issue with this proposal, but if Abbott wanted to know more about that, he could ask TxDOT to provide him with some answers. And sure, HSR isn’t cheap, but then neither is our road infrastructure cheap to operate, maintain, and especially expand. Building highways also involves a lot of eminent domain, though for some reason the uproar over that is always more muted. You tell me what the difference is, I have no idea. It’s going great, according to the CEO of Texas Central High Speed Railway. Realty News Report: When will Texas’ first high-speed passenger railway between Dallas and Houston actually begin service? Tim B. Keith: We expect to begin construction on the nation’s first truly high-speed train system as early as next year. We expect that construction will last about four years, and that 2022 will be the first full year service. Realty News Report: Has any land been acquired yet? Tim B. Keith: Overall, the response to the project’s ongoing work with landowners has been positive. We have recently begun a voluntary land purchase program. As a result of personalized conversations with landowners we are encouraged with the progress. Our conversations with landowners are in various stages of the process, including those who have fully agreed to sell their land. Realty News Report: There’s a massive amount of right-of-way to be acquired between Houston and Dallas and eminent domain will be employed. Can you please tell us about your plan for undertaking this? Tim B. Keith: High-speed rail has one of the smallest land footprints per user of any method of transportation. We estimate that the train will operate on a very narrow footprint at approximately 100-150 feet wide in areas where the tracks will run. The project’s land purchase program has recently begun and we are encouraged by its early results. Texas’ Constitution and state statutes have long granted eminent domain authority to railroads such as Texas Central, as well as pipeline companies, electric power companies and other industries. All support the creation of infrastructure necessary to serve the public efficiently and enjoy a healthy economy. The development of a high-speed train that will bring widespread benefits to Texans is built on positive relationships directly with property owners, and any use of this legal authority would be as a last resort. Our goal is to work with landowners and never have to use the court system in this process. With the growth of population over time, high-speed rail is the most efficient way to move the most people using the most efficient amount of land. The rest is all stuff we know. It’s not surprising to think that some people have been happy to sell to Texas Central. Some others can probably be persuaded, with a third group not being interested at all. For this latter group, Texas Central will need to use eminent domain to get the land they need, but to get to that point they’ll have to survive the 2017 Legislature as well as an AG opinion, either of which could block them. If nothing bad has happened to them in the next ten months or so, they ought to be in great shape. If not, I hope they have a Plan B in place. Link via Swamplot.